Save $50 (after mail-in rebate) on a Sony® PictureStation™ DPP-FP55 printer. Offer ends November 18, 2006. $99.99 after rebate. Get 30% off Micro Vault Tiny USB Flash Drives. These byte-sized drives offer heavyweight storage capacity. Offer ends September 21, 2006. Have some fun with your VAIO. Great PC games under $10. Sony Rewards. The fastest way to earn Sony Card(sm) Rewards is here at Sony Style. Get $100 card credit after your first purchase. Sony has the VAIO TX770P/B Notebook with VAIO Bluetooth Wireless Mouse for $2,399.99 with free shipping. The DSC-W50 combines sleek metal body and compact design with new high-tech features for image quality and operating convenience. Super-sharp 6.0-megapixel resolution delivers more detail when you're cropping or making big prints. Carl Zeiss 3x optical zoom lens and High Sensitivity Mode (ISO 1000) combine to produce sharp images even in low-light conditions. And Sony's original Clear RAW NR processing circuitry minimizes the color noise distortion of high-sensitivity shooting. Amazon.com has the Sony Cybershot DSCN1 8.1MP Digital Camera on sale for $376.94 with free shipping. About the size of a deck of playing cards, the stylish Cybershot DSCN1 is a high-performance, 8-megapixel camera, with an amazingly large, 3.0-inch, touch-screen LCD that is rare for a compact camera of this size. Carl Zeiss 3X Optical/6X Digital zoom, 26 MB internal memory for capturing images in-camera, and high-stamina Lithium Ion rechargeable battery. A built-in Memory Stick(R) Duo card slot lets you add additional memory for more practical image storage. Like those of other recent T-series models, we found the lens on the Sony T30 to be of higher than average quality for a subcompact camera, and image quality was quite good as a result. The 7-megapixel CCD delivers plenty of resolution for large prints, and the smattering of scene modes makes it easy to bring back good-looking photos from what would otherwise be difficult shooting conditions. The biggest news of course, is the T30's Super SteadyShot image stabilization, which we found to be very effective. This will let you get crisp shots even when faced with hand-holding the camera under surprisingly dim lighting (assuming of course, that your subject is stationary as well). Of course, a tripod is always recommended when things get really dark, but we were very pleasantly surprised to see just how dark it could get, while we were still snapping sharp photos. On the other side of the coin though, we found the Sony T30's higher ISO modes rather noisy when shooting after dark, diminishing their usefulness. All in all though, we found the Sony DSC-T30 a delight to use, and its Super SteadyShot image stabilization made a huge difference in our ability to hand-hold long exposures. Bottom line, this would be a great camera to take along on a vacation: Super compact, able to handle a wide range of conditions, and able to save a lot of shots from what would otherwise be fatal camera-shake blur. An easy Dave's Pick as one of the more worthy digital cameras on the market, but I'd really like to see lower high-ISO image noise after dark. Camera performance is excellent in almost all areas. The T30 starts up in a little over a second, focuses very quickly, and shutter lag was not a problem. Battery life was superb for an ultra-compact camera, and the USB 2.0 High Speed support will quickly transfer those big photos and movies to your PC. The only disappointment in this area was the burst mode, which chugs along at just 1.1 frames/second. If you want an ultra-compact camera that offers style, performance, image stabilization, and a huge LCD display then the Sony Cyber-shot DSC-T30 is for you. It's not for people who want manual controls or those who shoot under unusual lighting -- but for everyone else, this little camera is well worth your time. 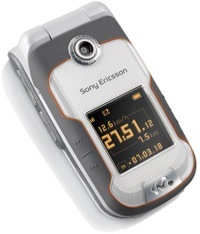 Listening to music while exercising takes a new turn today as Sony Ericsson introduces the W710 Walkman® phone. Designed to support an active, sporty lifestyle, the W710 includes a motion sensor plus new fitness applications that measure your running speed, distance and time, or simply count your steps when walking. Sporty good looks, a high performance Walkman® player and easy-to-use interface all combine to make the W710 the perfect sporting partner, whether you’re running for fun or keeping a check on how much you walk each day. 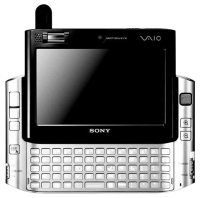 I consider the VAIO UX a Must have GIZMO. Crammed into the VAIO is a 4.5” XBrite touchscreen LCD with a 1024x600 resolution, an Intel Core Solo ULV processor running at 1.2GHz and features 512MB of RAM, a 30GB hard drive, a slide out keyboard, Wi-Fi, Bluetooth, EDGE, USB 2.0, a MemoryStick Duo slot, a CompactFlash slot, a folding antenna, two cameras and a biometric fingerprint sensor. Need more, Okay how about a docking station that tacks on three more USB ports, FireWire, Ethernet, VGA output, and an A/V port. The only thing missing is a beer dispenser. The Sony Cyber-shot DSC-W70 is a stylish, compact camera that takes great pictures. With its 7.2 megapixels, you get plenty of resolution even if you have to crop out some bad areas of your image. The 3x optical zoom is pretty standard these days, but it helps you get a little closer. The very nice 2.5 inch LCD doesn't have a ton of resolution (115K pixels), but it's very bright and easy to see, even on bright sunlit days. Images are sharp, colors are good, and the camera handles tough lighting conditions well. It also does a good job of flash-lit indoor shots, a place where many consumer digital cameras do poorly. Battery life was very good. I took 100-150 shots under normal use while I gathered sample images. Then, in an attempt to discharge the batteries, I hit the 300 image mark with the flash shooting each time. After the 300th image, I gave my finger a break. The camera still had plenty of juice to keep going. Sony's claim is 390 images, so I think under normal use, you will probably get between 300 and 390 shots. To me the system looks just okay. Nothing overly impressive about the design from what I've seen thus far, but gameplay and content are the key. Honestly, the PSA just seems like the Blu-Ray version of 360. Maybe the graphics will be better then it's predecessor, but who knows.